(fl ? Paris, 1538–59). French composer. Nothing about his life is known, not even his 'full name'. Nevertheless his compositions are certainly 'above average'. Twenty of his extant chansons appeared in Attaingnant’s publications in Paris between 1538 and 1549. 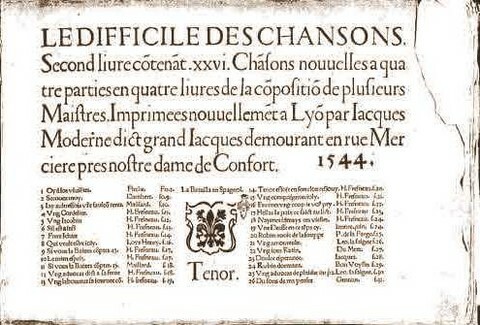 Jacques Moderne (Lyons) printed one song, Marot's Du fons de ma pensée (psalm 130): Le difficile des chansons, 1544. See below for a copy of the titlepage (The Psalm is last on the list). The score can be found on the page with sheet music. Most of the texts are anonymous épigrammes or chansons (voix de ville) composed in a largely homophonic manner akin to that of Sandrin. A richt texture, and expressive, dense. The popularity of at least three of Gentian's chansons is attested by their intabulations for lute by Alberto da Ripa, Guillaume Morlaye and Julien Belin. More info on my website on Clément Marot, section music. First part of this Psalm (composed like a chanson - motet). The other two parts on the website dedicated to Clément Marot's music.